This time we get a different perspective on alien takeovers... and it's almost as exciting as a traffic stop. One of the more practical uses of cameras is their installation into the dashboards of police cruisers, keeping an electronic watch on the watchers. 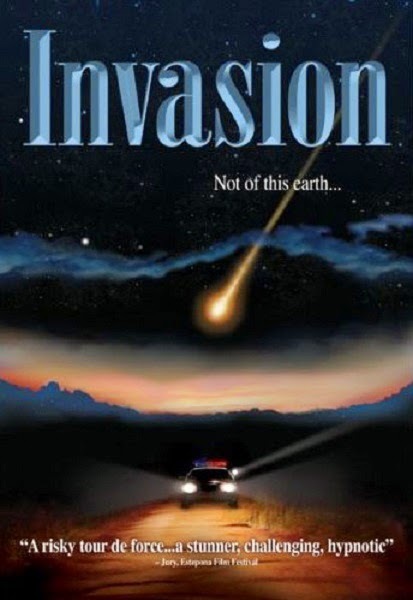 So when I first heard about Invasion (AKA Infection), an alien invasion flick with the events captured on a police car camera, it seemed like a novel idea with potential for some creepy moments if done properly. Invasion is a perfect example of it not being done properly. We start with a cryptic amateur news report about a small town in California being quarantined by the military before our view shifts to what will remain our POV for the entirety of the film, a dirt road at night being traveled by a police cruiser. At first, as the grassy terrain speeds by, illuminated only for a narrow stretch by the cars headlights, we can feel ourselves on edge. It seems like any second something might burst from the underbrush to startle us. The most we get is a rabbit. The car’s driver is deputy Brick Bardo (Scott Paulin), who’s investigating reports of a meteor coming down in a national park. But the local man he’s assigned to check on attacks him, infecting him with a space slug that quickly takes our unprepared lawman over and instantly turns him into an alien foot soldier, which in this case involves walking like babies on their feet for the first time and speaking backwards. From there, most of the film follows Cheryl (Virginia Dare), a young teen just looking to make out with her prom date who ends up behind the wheel of the cruiser and struggling to find a way out of the park, her every turn blocked by more of the infected residents. Pyun sets the ambitious goal of filming an entire story in one unbroken shot, but as opposed to something like Russian Ark or Timecode, he hedges his bets by having very little happen. Once the threat is established and Cheryl emerges as our heroine, there is little for her to do but drive down the road, run into the same four infected characters, turn around to drive all the way back to the end of the road and then turn around and repeat. Pyun attempts to mine drama out of her radio conversations with Bardo’s police colleague, who sounds as though he’s caught in a much more interesting side of the invasion plot than Pyun can afford to depict here, but as radio drama it’s not all that compelling. The acting isn’t much to speak of, though Dare does what she can with what little she’s given, mostly panicking and self-pityingly wondering why this is happening to her. Otherwise even at fifty minutes (Pyun includes fifteen minutes of super-slow end credits to get the film crawling to feature length), it’s a long haul without much to keep out interest. For special effects we get occasional flashes in the sky which I guess are supposed to suggest more meteorites landing and what little we see of the space slugs isn’t very impressive. Pyun does come up with one compellingly spooky image. At certain points we subtly become aware of a ghostly white form slowly coming down the road toward Cheryl. As eerie as this is, once we’re allowed to see what this shape represents, it raises a bunch of questions Pyun doesn’t bother to answer. He also fails to come up with a satisfying resolution. The film reaches a certain point and simply ends with another faux-news segment and a ridiculously solemn text wrap-up. One extra note: watching this on Netflix, I was left unsure of what the aspect ratio is supposed to be. While it was presented 2.35:1, there were several instances where what seemed to be important images, like a screenshot of the people on the other side of the radio conversations, are cut off at the frame line. I don't think this really had a huge effect in my perception of the movie but is worth mentioning.